I've been on a tool-making kick lately. 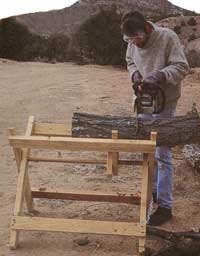 Truth be told, most of them have been pretty simple--more like jigs, really--but the other day Helena was asking me what I intended to do with the huge pile of unsplit logs I collected after Hurricane Sandy. "Split them for firewood!" I said. "What year?" She asked, curiously. The problem is, most of the logs I collected were hastily cut into longish length by the power company, which was more interested in getting electricity back on than supplying conveniently-sized firewood to cheapskates like me. So when it came time to split it, I realized most of it was too long to fit in my wonderful arm-powered splitter. The obvious thing to do was to buy a chainsaw, but since living a year in New Hampshire and meeting several people who had managed to chainsaw their legs (most common), toes, and even face (one very unlucky fellow), I have considered chainsaws to be above my pay grade. 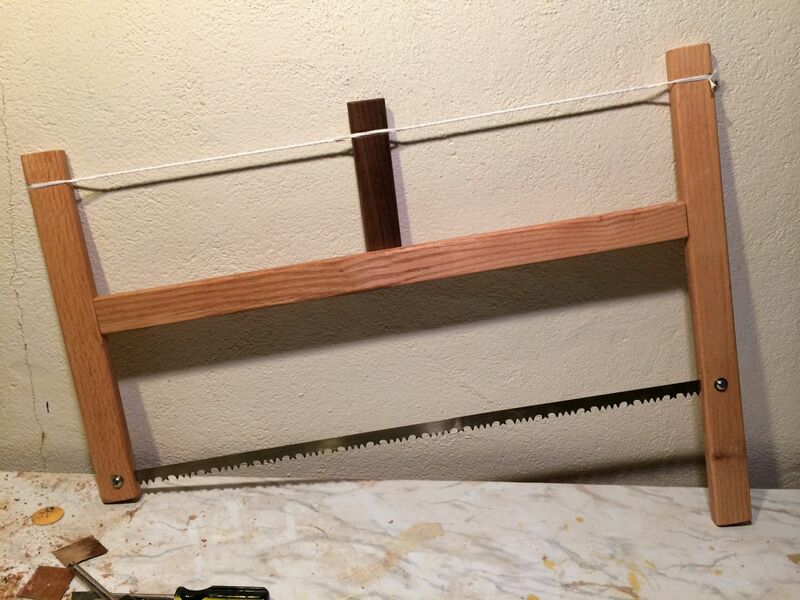 Naturally, I wanted to build mine out of scrap lumber, so the first thing I did was assemble all the likely-looking bits of wood I had in my scrap box. I had a lot of red oak left over from building Helena's radiator cover (which has held up very well to all that heat and humidity, btw. ), as well as some maple and walnut from the cutting boards. It was just a matter of picking out the best bits. I soon had the main pieces roughed out. 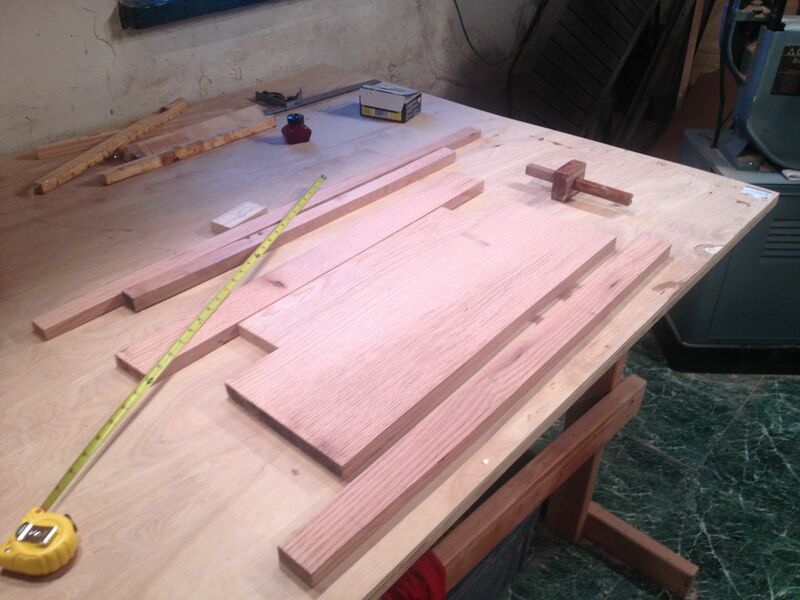 The three main pieces cut out and laid end-to-end, to see how they look. I planned on morticing the pieces together, which I have practically no experience with, so I wasn't sure which to tackle first: the mortise (hole) or tenon (thing that goes in the hole.) 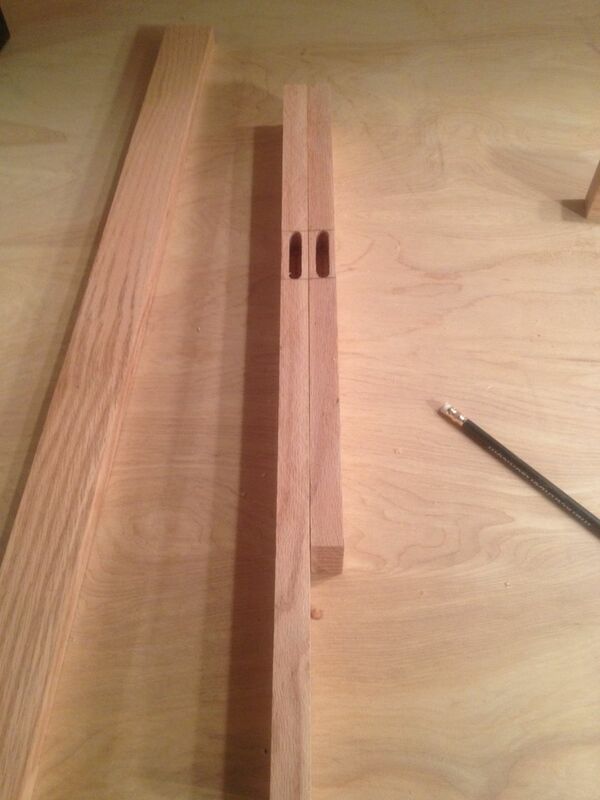 The tenon seemed easier to cut, so I figured I'd cut the mortise first, and then cut the tenon to fit. Not sure if that's the official way to do it, but it made sense to me at the time. Unfortunately, this was one of those jobs that's so brain-consuming that I forgot to take pictures, but you can guess how I did it from the results: I drilled two holes at either end of the mortice, and then dug out the wood in-between with a chisel. After doing this, I thought, "there must be a better way!" And of course there is. This being a how-not-to blog, I'd urge you to find a youtube video on mortice cutting before tackling a job like this, instead of after. 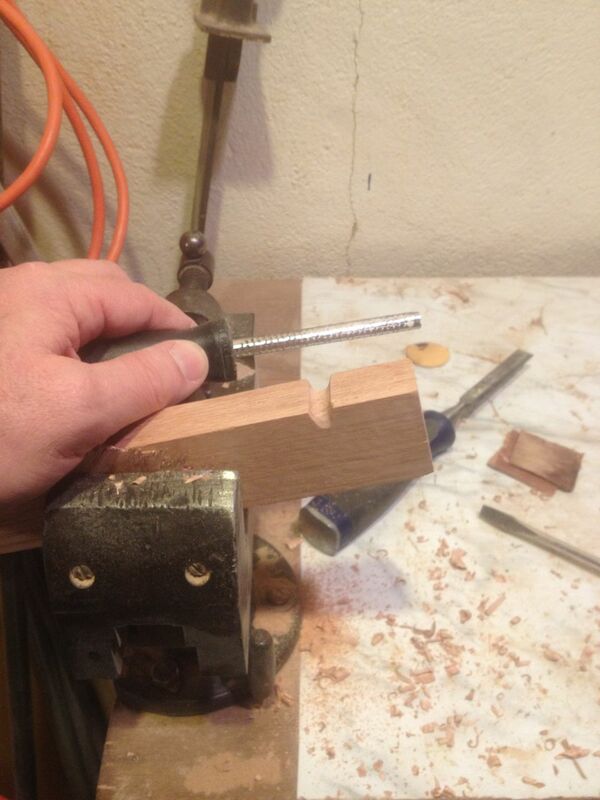 Turns out it's not that hard to cut mortices with square ends, but I was making this up as I went along. And then had to deal with making the square peg fit the rounded hole. Actually, it wasn't that hard. I really need to get a decent vice. 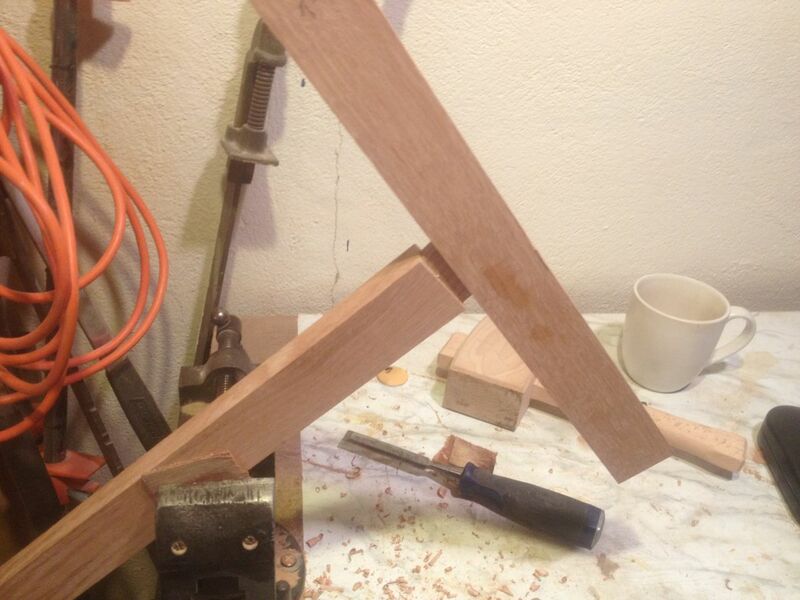 Fitting the tenon to the mortice was a trial-and-error process. With the main joints fitted, it was time to cut the slots for the blade. 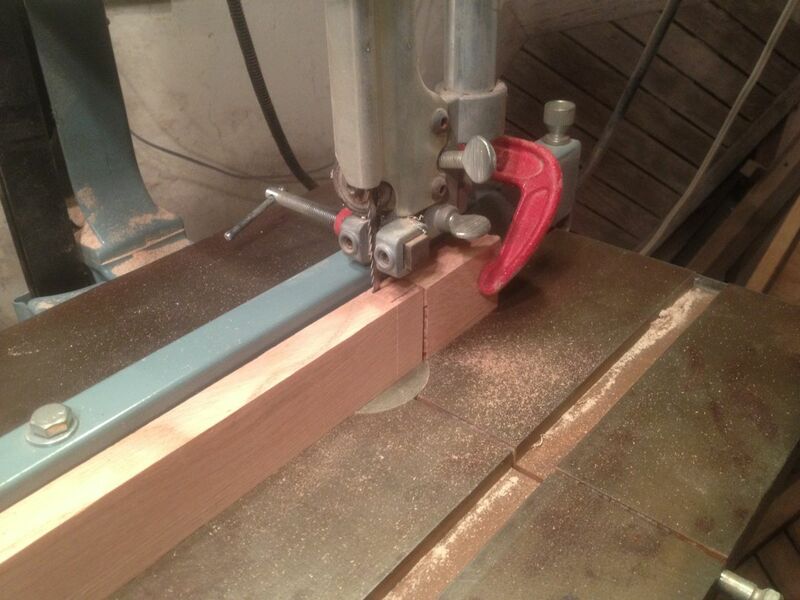 For the long handle, the slot needed to be cut right in the middle of the wood. Again, I did what seemed the easiest: I drilled a hole just big enough to thread a coping saw blade through, and then sawed the rest of the slot. 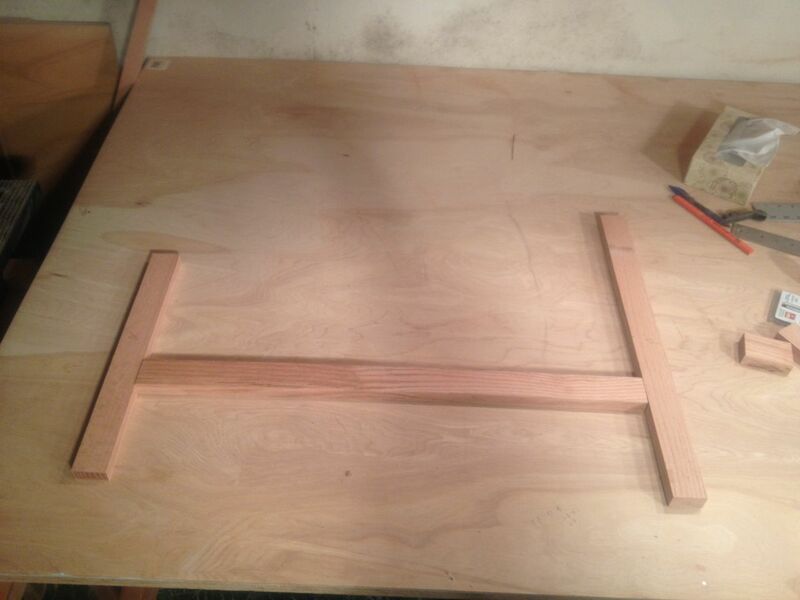 For the short handle, the slot is in the end, so I cut that on the bandsaw. Finally, I cut groves for the tensioning string, so the string would stay in place, rounding them over with a microplane file. 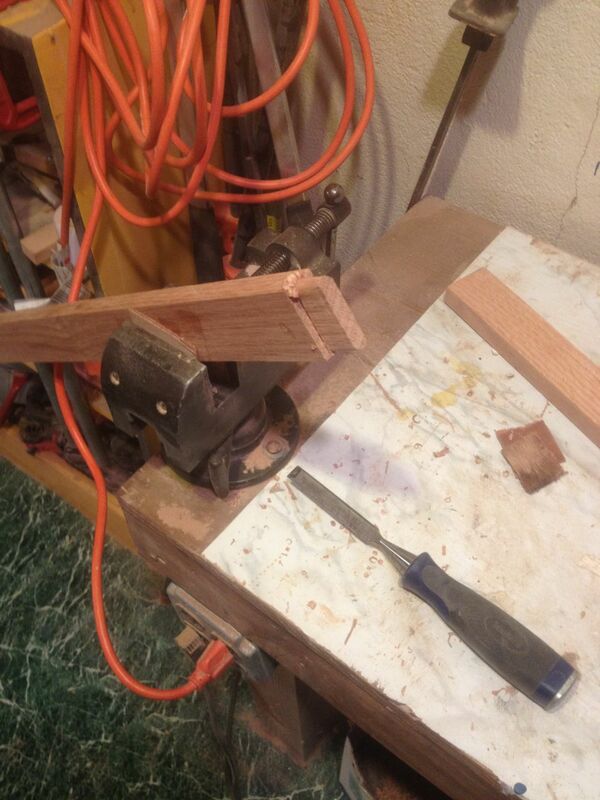 Finally, I needed a piece of wood for the Spanish windlass which tightens the blade. I had a nice scrap of walnut that would add a bit of color and contrast to the piece. I cut a shallow groove near one end for the string. After rounding over all the sharp edges on the router table, and giving everything a good rub with linseed oil, I assembled the saw. The 1-inch x 30-inch blade (only thing I bought, about $10 at the hardware store) is tightened by the Spanish windlass on top. This is just a long piece of string, wrapped about 6 times around the saw. 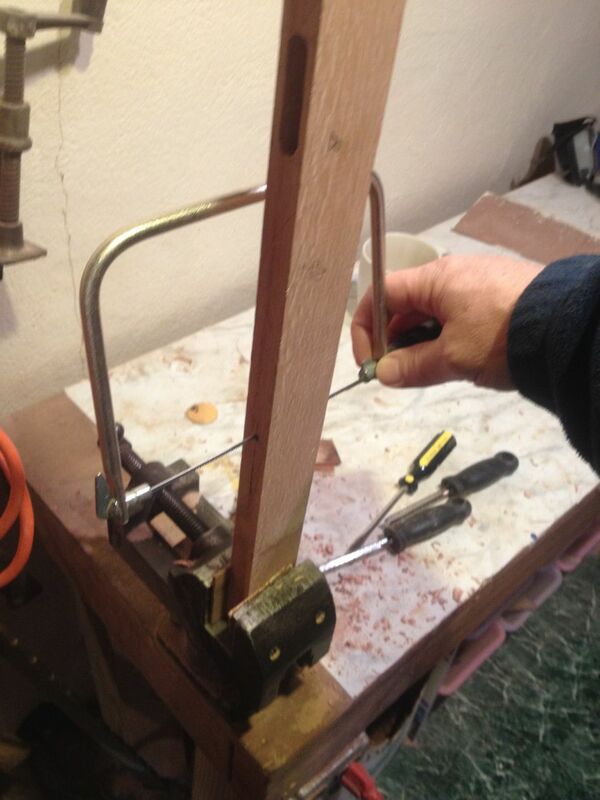 The walnut lever is inserted in the gap between the strands and twisted, round and round, until the blade is tight. The lever is long enough so it stays in place after tightening. You'd be amazed at how powerful that Spanish windlass is. If you build one, don't over-tighten the blade. It just needs to be tight enough so it doesn't flex when you use the saw. Too tight, and you will take the set out of the teeth, or so I heard on the Intertubes. And there you have it! A saw big enough to tackle the largest log in my pile. A nice weekend project, and I'm sure it will come in handy on some future boatbuilding project. 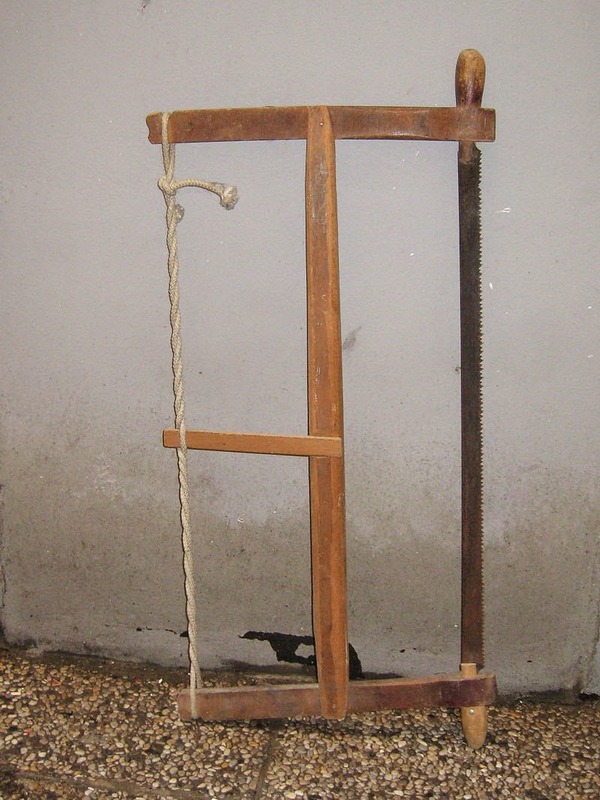 The 'log holder' pictured looks like a folding 'saw buck'. There are better designs to be found on the net. 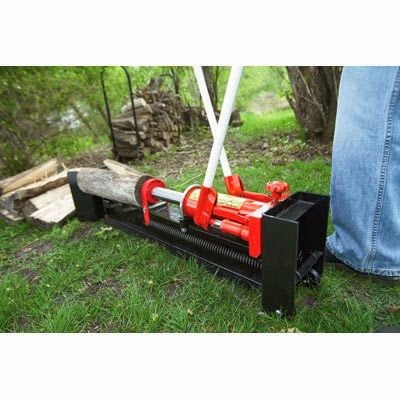 In use I prefer to place the chainsaw bar outside the saw buck so as to not make the saw buck into firewood. I haven't actually settled on a design. I just need to get the wood off the ground for sawing. Any suggestions for a better design, much appreciated.